With cannabis, you have a loaded subject, so to speak. Bringing up marijuana can often elicit nervous giggles. And people usually don’t know what they are giggling about. It’s time for all of us, especially government, to grow up. As cannabis continues to go mainstream, all of us, users and nonusers, need to get better educated on a very misunderstood plant. Over time, the general public will come to accept the many medical benefits derived from cannabis. What is more challenging is for everyone to enter a parallel universe where cannabis is accepted, integrated into our lives, and its use is common knowledge. To that end, one of the very best cannabis books as of late is “Weed: The User’s Guide: A 21st Century Handbook for Enjoying Marijuana” by David Schmader, published by Sasquatch Books. The good news is that, for responsible folks, easy accessibility to weed should be a relatively easy transition. Retail sales of cannabis in Washington state, for example, are already geared to an older, and supposedly wiser, demographic. These are going to be, by and large, people who have a stake in the community and are basically going to do the right thing, so to speak. They will buy some weed and treat it in the way they would having a glass of wine on the weekend. Well, that is one ideal scenario. Schmader’s book covers not only this neat and tidy group but all of us. People can overdo it. People can go blindly into something. You know, all of us. The above quote is part of the sensible approach that is much needed as the discussion on cannabis moves forward. It is insightful to use the coffee analogy. If a person picks that apart, it might prove to be a useful reference point. The consumption of cannabis can be a challenge to compare to something else or describe in an objective way. Supporters will cite that no one has died from overusing it. However, misuse of it will mess you up just like beer, wine, or even coffee, can trash you in their own unique ways. As a connoisseur, Schmader is good at not mincing words and getting to the point. Among numerous insightful factoids, you’ll learn one of the best weed hacks is to eat a mango before getting high. Both cannabis and mangoes have the chemical compound, myrcene, which speeds the delivery of THC to the brain. Schmader provides straightforward instruction on everything from how to use a bong to how to turn an apple into a pipe. You’ll get acquainted with a “green hit,” the first draw from a freshly packed bowl. You’ll get helpful suggestions on dose levels. And you’ll get cut-above recipes like his instructions on how to make your own tinctures. Given the chance, some people would eat a whole chocolate cake. Thanks to David Schmader’s book, you can see how you can avoid eating the whole cake and still have a fun party. 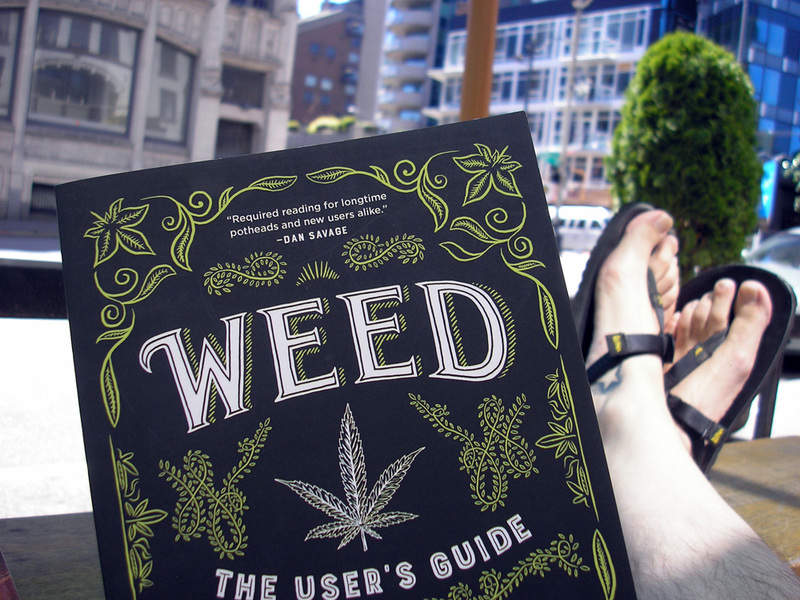 “Weed: The User’s Guide: A 21st Century Handbook for Enjoying Marijuana” is a 208-page paperback. For more details, visit Sasquatch Books right here. Thanks. Glad you enjoyed the review. I’m very keen to read that one. Cheers for the heads up! Good book! And David is a good guy! One of the most honest and fun books on the subject.